Maybe Muscle Momentum BCAA Force’s one gram of BCAAs per two-capsule serving won’t blow you away. However, its superior nutritional value and ingredient safety is sure to give you a fast return on your hard-earned investment, as you’ll find out in this review. Labdoor-approved. This product made it to Labdoor.com’s Top BCAAs list. Superior nutritional value and ingredient safety. Labdoor gave it a grade of 97 and 90, respectively. Provides ample amounts of iron and zinc. Studies reveal these minerals help ramp up exercise performance. Suggested Use: Take 1 serving 30 minutes prior to training and 1 serving immediately after training. Other Ingredients: Capsules (Gelatin), Maltodextrin & Magnesium Stearate. We also recommend trying BCAA supplements in capsule form. First off, they’re more convenient: you don’t need to stir or shake them in a blender bottle. All you need to do is take them with a glass of water. Second, many bodybuilding supplements in powder form contain fillers such as artificial food colorings and sucralose. These ingredients have several side effects (allergies, carcinogenicity, obesity, etc.). Whenever we spot these in a bodybuilding product, we flag them. Unfortunately, many BCAA powders (such as MHP BCAA-XL ENERGY) have these. If you take a BCAA capsule, it’s unlikely they do. On that note, we’re hoping Muscle Momentum BCAA Force will exceed your lofty expectations. The manufacturer says this dietary supplement helps “muscles recover faster,” per its official website. Muscle Momentum BCAA Force should help your muscles recover faster, and then some. Muscle Momentum BCAA Force is currently the 12th-ranked BCAA product on Labdoor.com. While its nutritional profile won’t blow you away, there has to be something about this product which makes it stand out from the rest. We’re excited to find out, to say the least. Muscle Momentum BCAA Force has a total of one gram of branched-chain amino acids (BCAAs) per two-capsule serving. Certainly, this much won’t blow you away like the aforementioned GAT Sport FLEXX BCAAs (which has an insane seven grams of BCAAs and 3.5 grams of l-leucine per one 11.5-gram scoop). Muscle Momentum BCAA Force also has one of the more unusual ratios we’ve seen – it has 460 milligrams of l-leucine, 384 milligrams of l-valine, and 156 milligrams of l-isoleucine per serving. Many competitors rely on a 2:1:1 BCAA ratio because experts believe this helps consumers reap the product’s full benefits. For its part, Muscle Momentum BCAA Force doesn’t have an exact BCAA ratio – it prioritizes l-leucine, l-valine, and l-isoleucine in that order. This begs us to ask, why is Muscle Momentum BCAA Force one of the best in the business despite its low BCAA amount? Simple: the secret lies in the intangibles. Let’s see how it stacks up against several of Labdoor’s top-rated BCAA supplements. On this note, Muscle Momentum BCAA Force is a respectable source of iron and zinc – two crucial minerals for optimum health. The former helps keep anemia at bay, regulate body temperature, form hemoglobin, improve sleep quality, and enhance cognitive function. Iron’s ability to produce hemoglobin (the protein molecule in red blood cells) should complement your training program perfectly. In fact, the August 1, 2000 issue of The American Journal of Clinical Nutrition says, “It is clear that reductions in hemoglobin concentration and tissue iron content can be detrimental to exercise performance.” The good news: Muscle Momentum BCAA Force’s decent iron content should help you train harder at the gym. It turns out zinc is just as crucial as iron in terms of exercise performance. “A decline in cardiovascular function and total work capacity of skeletal muscles as a result of acute zinc depletion further emphasize zinc’s role in exercise performance,” per the September 14, 2014 issue of OMICS International. With that, Muscle Momentum BCAA Force’s ample amounts of iron and zinc should help you train harder. No doubt about it. This supplement’s other strong suit is its ingredient safety. According to Labdoor.com, BCAA supplements garner an average score of 88 percent in this criteria. 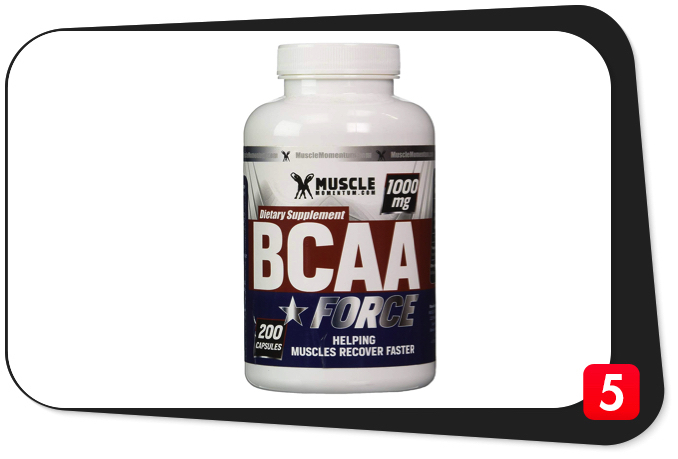 Muscle Momentum BCAA Force’s score of 90 percent puts it slightly above the competition. Bear in mind many bodybuilding supplements contain nasty fillers. This one doesn’t. Your body will love you for it. The key takeaway: Muscle Momentum BCAA Force (just like Sheer BCAA and Do Vitamins BCAA Capsules) is about quality rather than quantity. Other BCAA supplements such as GAT Sport FLEXX BCAAs’ BCAA content may blow Muscle Momentum BCAA Force’s out of the water, but the latter has the final say in terms of quality. Think about it: between the two products, which made it to Labdoor’s Top BCAAs? At the end of the day, sometimes less is more. L-leucine is the most anabolic amino acid which helps kickstart the muscle protein synthesis (MPS) process. When you exercise, MPS decreases. “After exercise, recovery of muscle protein synthesis requires dietary protein or BCAA to increase tissue levels of leucine in order to release the inhibition of the initiation factor 4 complex through activation of the protein kinase mammalian target of rapamycin (mTOR). Leucine’s effect on mTOR is synergistic with insulin via the phosphoinositol 3-kinase signaling pathway. Together, insulin and leucine allow skeletal muscle to coordinate protein synthesis with physiological state and dietary intake,” per the February 2006 issue of The Journal of Nutrition (via NCBI.NLM.NIH.gov). Not only will l-leucine help you grow muscle mass, but some studies also reveal it’ll help you preserve it. Plus, l-leucine also helps increase fat loss and ward off inflammation. Muscle Momentum BCAA Force’s 460 milligrams of l-leucine per two-capsule serving may seem minuscule on paper, but there’s no denying it has superior quality (based on the Labdoor findings). You can always complement this BCAA supplement with a top-notch protein powder to help you achieve your muscle-building goals. Muscle Momentum BCAA Force gives you 384 milligrams of l-valine per two-capsule serving. This BCAA helps repair muscle tissue, increase exercise endurance, quell anxiety, improve sleep quality, regulate immunity, and suppress appetite. On the other hand, l-isoleucine also helps increase exercise endurance and repair muscle tissue. It also helps maintain a positive nitrogen balance, shorten recovery time, form hemoglobin, and regulate blood sugar levels. L-isoleucine’s role in the hemoglobin production process should complement Muscle Momentum BCAA Force’s ample iron content perfectly. These two components will work synergistically to help you get the most out of your workouts. Muscle Momentum BCAA Force is one of the few BCAA supplements which has more l-valine than l-isoleucine. More often than not, a BCAA supplement has a 2:1:1 BCAA ratio. That means l-valine and l-isoleucine have the same amounts. Both have crucial health and fitness benefits. We’re not certain why the manufacturer placed more emphasis on l-valine. We suppose l-valine’s abilities to boost immunity and suppress appetite have something to do with it. All in all, Muscle Momentum BCAA Force is one product which can easily fly under the radar because of its “minuscule” BCAA content. However, quality speaks volumes in the bodybuilding supplement industry. This is the classic case of a high-quality underdog trumping those wannabe bigger-name BCAA supplement contenders. L-leucine, 460 mg: The most anabolic amino acid which helps kickstart the muscle protein synthesis (MPS) process. L-leucine also helps preserve hard-earned muscle mass, increase fat loss, and keep inflammation at bay. L-valine, 384 mg: The second-most abundant BCAA in Muscle Momentum BCAA Force helps repair muscle tissue, increase endurance, improve sleep quality, keep anxiety levels in check, suppress appetite, and boost immunity. L-isoleucine, 156 mg: This BCAA helps increase endurance, repair muscle tissue, regulate blood sugar levels, maintain a positive nitrogen balance, produce hemoglobin, and shorten exercise recovery time. If you’re iffy about those big-name BCAA supplements with outrageous BCAA amounts, Muscle Momentum BCAA Force should be right up your alley. We daresay this is a fly-under-the-radar supplement which screams quality from top to bottom. After all, Labdoor.com wouldn’t include it in its Top BCAA list for nothing. One gram of branched-chain amino acids (BCAAs) per two-capsule serving won’t blow you away. However, Muscle Momentum BCAA Force’s impeccable nutritional value (97 percent, per Labdoor) and ingredient safety (90 percent, per Labdoor) make it a cut above the rest. That’s saying a lot, considering many bodybuilding supplement manufacturers taint their products with fillers and the like. When you supplement with Muscle Momentum BCAA Force, you’ll get ample doses of iron (11.2 percent of its RDA for men 19-50 years old and five percent of its RDA for women 19-50 years old) and zinc (11.8 percent of its RDA for men 19-50 years old and 16.2 percent of its RDA for women 19-50 years old). The common denominator: both minerals help boost exercise performance. We’re certain this supplement will help you get the most out of your workouts in conjunction with sound nutrition and enough sleep. Muscle Momentum BCAA Force has one of the more unusual BCAA amounts we’ve seen: 460 milligrams of l-leucine, 384 milligrams of l-valine, and 156 milligrams of l-isoleucine per two-capsule serving. This is a non-conformist BCAA supplement in every sense of the word. Forget about the traditional 2:1:1 BCAA ratio for now. It’s clear Muscle Momentum BCAA Force has its own unique identity. Will it work? We’re confident it will, especially if you pair it up with a top-notch protein supplement to help you muscle up. Like we said, this product has more l-valine than l-isoleucine, which is somewhat unusual. We suspect it’s because of the former’s abilities to suppress appetite and fire up the immune system (which may take a hit when you train hard consistently). As for transparency, we give the manufacturer high marks. It reveals all of the ingredient amounts. You also won’t find any dirty ingredients in Muscle Force in Muscle Momentum BCAA Force. These bode well for customers’ long-term health. Consumers have also given this product high marks online. It turns out the Labdoor.com assessment was spot on all along. Plus, one 200-capsule bottle costs just $20.00 on Amazon.com. That’s a good deal, if you ask us. We found no glaring weaknesses in Muscle Momentum BCAA Force. You can make a case for the somewhat low BCAA amounts, but like we said, quality precedes quantity. Labdoor.com and customers alike have spoken. So have we. This is one BCAA supplement worthy of a spot in your bodybuilding supplement stack. “Our unique BCAA formula is designed to drastically help eliminate muscle soreness and sluggish feeling. “Faster recovery means more sets and longer reps. Increase strength, gain mass, and drop body fat percentage easier than before. “Our BCAA increases fat burning and glucose tolerance. This gives you more visible definition. Get ripped faster! “Helps keep energy higher. No more feeling sleepy whilst exercising,” per the manufacturer’s official website. We agree with all of these claims. Muscle Momentum BCAA Force is an underrated player competitors should reckon with. The manufacturer intended Muscle Momentum BCAA Force for healthy and active individuals who are at least 18 years of age who want to increase muscle mass and fat loss, shorten recovery time, ward off muscle soreness, and achieve their daily fitness goals. While Muscle Momentum BCAA Force has no glaring side effects, please consult your doctor if you feel doubtful about any of its ingredients. Labdoor-approved. One of the best BCAA products on Labdoor.com. Great value for nutritional value and ingredient safety. Scored 97 percent and 90 percent, respectively, on Labdoor. Clean ingredients. You won’t find any fillers in Muscle Momentum BCAA Force. Great reputation. Customers have sung this supplement’s praises online. Affordable. One 200-capsule bottle costs $20.00 on Amazon.com. No glaring weaknesses. This is one BCAA supplement in capsule form worth your while. It bears repeating: Muscle Momentum BCAA Force is an under-the-radar supplement which trumps bigger name BCAA products with insane BCAA amounts. The secret lies in its quality. One gram of BCAAs per two-capsule serving may not blow you away, but its top-notch nutritional value and ingredient safety make it a worthy investment. We highly recommend you buy Muscle Momentum BCAA Force. We’re confident this underrated player will help your muscles recover faster and much more.